We are a theoretical and computational biophysics group in the Department of Physics and Astronomy at Clemson University, College of Science. We apply concepts and methods in Physics, especially Statistical Mechanics and Thermodynamics, to study biological systems, and try to learn new physics emerging from the complex systems. The major theme throughout our research is to integrate dynamics into the study of structure-function relationship of biomolecules and molecular complexes. We believe that uncovering the interrelationship between structure, dynamics, and function of biomolecules can help better understand biology and human diseases, and accelerate biomedical research. Our research focus is multiscale modeling of biomolecules and molecular complexes. Experimental characterization of biological systems is often hindered by the limited ability to cover a wide range of time and length scales, associated with many biological processes. Multiscale modeling, which innovatively combines atomistic and coarse-grained simulations, provides a unique opportunity to bridge the gaps of time and length scales between experimental observation and underlying molecular systems. We apply the multiscale modeling approach to study structure, dynamics, and function of large biomolecules, formation of molecular complexes, and also interactions between nanomaterials and biological systems. We are always interested in enthusiastic colleagues to join our lab. Accumulating evidence suggests that the aggregation of islet amyloid polypeptide (IAPP, a.k.a. amylin) is associated with β-cell death in type 2 diabetes (T2D). IAPP is co-secreted with insulin by pancreatic beta-cells, and also works together with insulin to control the serum glucose level. In vitro studies suggest that IAPP is one of the most amyloidogenic peptide, which forms amyloid fibrils within hours at micromolar concentrations. However, no apparent IAPP amyloid aggregates are observed in healthy individuals where IAPP is stored in β-cell granules at milimolar concentrations for hours before being secreted to the blood stream. Therefore, physiological conditions of β-cell granules natively inhibit the amyloid aggregation of IAPP. The advancement of nanomedicine and increasing applications of nanoparticles (NPs) in consumer products have led to administered biological exposure and unintentional environmental accumulation of NPs, causing concerns over the safety and sustainability of nanotechnology. Other sources of NP pollutions include combustion processes from human activities, such as petroleum-fueled vehicles. Therefore, there is a crucial need to understand the molecular mechanism of nanotoxicity to ensure safe nanotechnology and enable the vast applications of nanomedicine. A major challenge in modeling molecular recognition is the conformational flexibility. The structures of the receptors in the bound and un-bound states are often different, known as the induced-fit problem. In these cases, a rigid docking approach will fail to achieve accurate predictions. Existing flexible methods for modeling molecular recognition or docking often adopt the ensemble docking approach, where an ensemble of receptor and/or ligand conformations are pre-constructed. Rigid or semi-rigid docking is performed onto these structures in the ensemble. The predicted binding poses are then selected from the grand ensemble of poses. 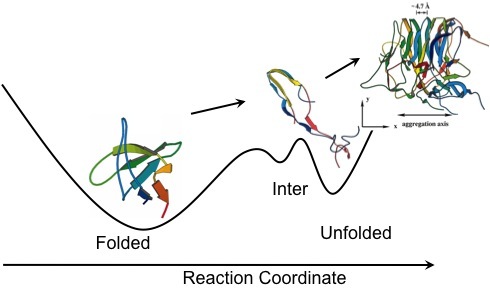 In another words, the conformational flexibility of ligands and receptors are modeled in a decoupled or loose-coupled manner. Once the bound-conformation is not included in the pre-constructed ensemble, accurate prediction will be difficult. Alternatively, we fully integrate the conformational flexibility into the modeling of molecular recognition. Many PTM enzymes have strong sequence preferences in the targeted substrate proteins/peptides while others do not. What are the molecular mechanism of such drastic differences in PTM enzyme specificities? It is expected that the binding affinity between substrate and enzyme plays an important role in defining the specificities. Interestingly, in the case of tyrosylprotein sulfotransferase proteins (TPST) affinity alone cannot explain the differences in sulfated and non-sulfated sequences. We found that the structural properties of the peptide in the host protein also play an important role in determining the TPST specificity. We are trying to extend this idea to other PTM enzymes. The ability to accurately manipulate a protein’s structure, dynamics and function, and eventually to create de novo proteins with specific functions is the holy grail of modern biology. The success in protein design & engineering requires the accurate knowledge of inter-residue interactions, protein folding, protein-ligand and protein-protein recognitions, and also the molecular mechanism of catalysis. For example, the design of an enzyme needs the sub-angstrom precision in strategically positioning residues important for catalysis. Therefore, computational modeling plays a crucial role in protein design. Despite some recent successes in protein design, we are still far from perfect, requiring better understanding of inter-molecular interactions and faster sampling approaches. 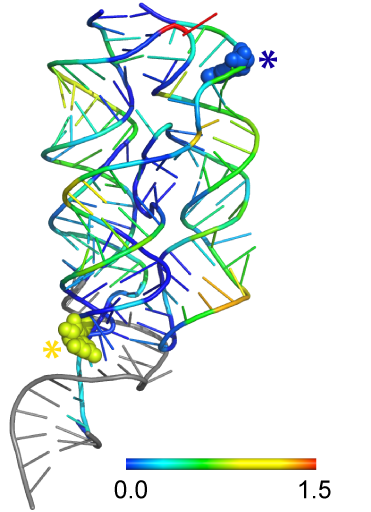 RNA structure determination is one of the major challenges in structural biology. Many RNAs are not amenable to high-resolution structure characterization by either x-ray or NMR methods because of their conformational flexibility or large size. Recently, novel computational methods to determine RNA structures have begun to emerge, but have often been limited to small RNAs with simple topologies due to either sampling problems or inaccuracy in force field. We developed a discrete molecular dynamics (DMD)-based RNA modeling approach, which allowed robust recapitulation of 3D structure of small RNA structures (< 50 nts). To fold large RNAs with complex 3D structures, we proposed to incorporate experimentally-derived structural information into modeling. Using various types experimentally-derived structural information to bias DMD simulations, we were able to recapitulate 3D structure of RNAs with complex topologies and lengths up to 230 nts. We expect a broad application of our experimentally-driven RNA modeling approach for generating robust structural hypotheses that are useful for guiding explorations of structure-function relationships in RNA. ATTENTION: A postdoctoral fellow position is available. 2019.3.1. Our work on the aggregation of hIAPP8-20 via accumulation of helical oligomers, alpha-helix-to-beta-sheet transition, and beta-barrel intermediates has been accepted for publication in Small and featured as the inside Cover article. Congratulations to Yunxiang and Yanting! 2018.12.1. Combining both experiments and simulations, we showed that the early aggregation of full-length hIAPP features the accumulation of helix-rich oligomers, among which the nucleation of beta-rich structures and beta-barrels takes place. The work first authored by Yunxiang is now published in BBA - Molecular Basis of Disease. 2018.10.20. Our joint work with Monash University, Tongji University, and Qingdao University on inhibiting hIAPP aggregation and toxicity with Graphene Quantum Dots is accepted for publication in Nanoscale. Congratulations to Dr. Yunxiang Sun! 2018.10.1 Our combined computational and experimental work about the effects of Chiral Silica Nanoribbons on hIAPP aggregation is in press with Small. Congratulations to Dr. Yunxiang Sun and the collaboration team! 2018.9.15. Our joint work with Dr. Hugo Sannabria and Dr. Mark Bowen on identifying the weakly populated conformational states of PDZ1-2 of PSD-95 are published in Nature Comm. Congratulations to Bo! 2018.5.10. Our joint work with ARC Centre of Excellence in Convergent Bio-Nano Science and Technology in Australia and University of Warwick in UK on serum protein binding with hIAPP amyloid fibrils - i.e., the formation of amyloid corona - is published in ACS Nano. Congratulations to Yanting! 2018.1.29. Our work on uncovering the molecular mechanism of the cross-talk between Alzheimer's disease and type-2 diabetes is now in press with ACS Chemical Neuroscience. Congratulations to Xinwei, Yang Ye and Yunxiang! 2017.10.17. Our joint work with Monash University (Australia) entitled "Star Polymers Reduce IAPP Toxicity via Accelerated Amyloid Aggregation" is now accepted for publication in Biomacromolecules. Congratulations to Xinwei and Bo! 2017.10.1. Yunxiang's paper on the Oligomerization and Fibrillization dynamics of peptides is accepted for publication in PCCP, where the aggregation free energy landscape is directly visualized! Congratulations to Yunxiang! 2017.7.25. Our review entitled "Modulating protein amyloid aggregation with nanomaterials" is now accepted for publication in ES Nano. Congratulations to Bo and Yunxiang! 2017.7.19. Our work on the endogenous inhibition of IAPP aggregation in pancreatic beta-cells, first authored by Xinwei, is now accepted for publication in Chem. Comm. The work is also featured as the front cover article. Congratulations to Xinwei! 2017.6.26. Our review paper "NanoEHS beyond toxicity – focusing on biocorona" has been selected as the front cover article by Environmental Science: Nano. 2017.5.15. Dr. Ding receives the Outstanding Young Researcher Award from College of Science, Clemson. 2017.2.24. Bo Wang is awarded outstanding graduate researcher by both the department and the new College of Science. Congratulations to Bo! 2016.9.23. Our paper "Brushed polyethylene glycol and phosphorylcholine for grafting nanoparticles against protein binding" first authored by Bo and co-authored by Xinwei is accepted for publication in Polymer Chemistry. The work suggests that brushed phosphorylcholine polymer is a better alternative to PEG as the grafting agent of nanoparticles to achieve anti-fouling properties. 2016.9.1. Bo Wang is awarded a career development supplement grant from NSF. Congratulations to Bo! 2016.8.31. Congratulations to the lab for being awarded the NIGMS MIRA award! 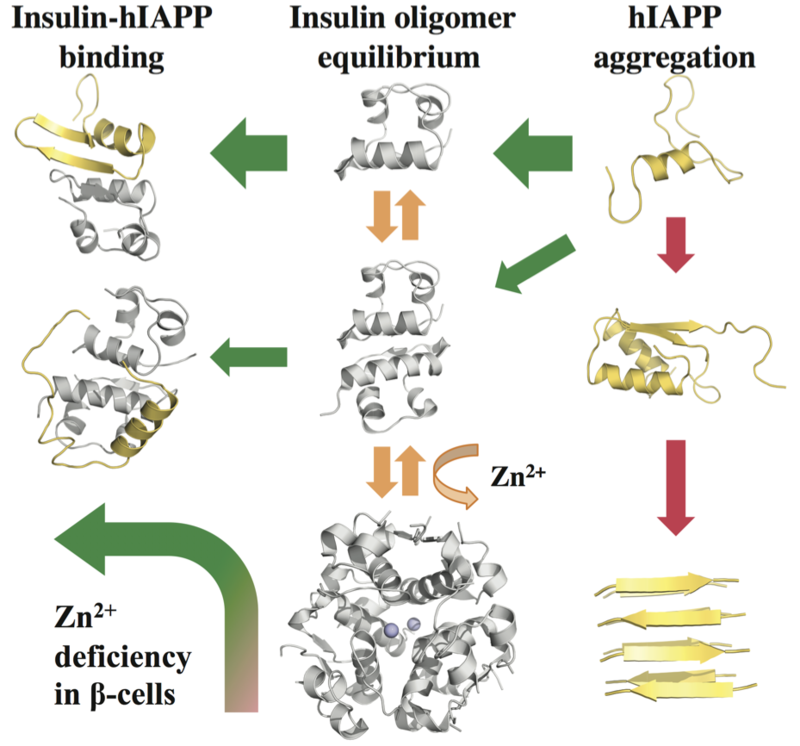 The project is entitled "Inhibition of Human Islet Amyloid Polypeptide Aggregation", which will allow us to uncover the aggregation mechanism of IAPP in type-2 diabetes and search for novel anti-amyloid approaches from three directions, including 1) the endogenous inhibition of IAPP aggregation in healthy individuals, 2) the inhibition of IAPP aggregation by small molecules, and 3) de novo designed nanomaterials with anti-aggregation properties. 2016.8.26. The positions have been filled! -- Our lab has an on-going opening for one or two postdoctoral fellows. The research project is supported by NIH to investigate amyloid aggregation related to type-2 diabetes and search for novel anti-amyloid therapeutic approaches. 2016.2.25. Our latest Small journal paper is highlighted in the current issue of Pancreatic Cell News. The work is the result of an international collaboration between Clemson University, University of Melbourne, St Vincent's Institute of Medical Research, and University of Michigan. 2016.2.16. Dr. Ding is selected for an NSF CAREER award - "Multiscale Study of the Structure and Dynamics of Nanoparticle-Protein Coronae". © 2019 Clemson Computational Biophysics Lab.